A new ranking system from the Oak Ridge National Laboratory and Indiana University will ferret out providers run by cybercriminals. Cybercrime—Exposing hackers . . . Unscrupulous Internet service providers will have no place to hide because of a ranking system conceived by researchers at Oak Ridge National Laboratory and Indiana University. “Criminal enterprises have created entire Internet service providers dedicated to sending spam, phishing messages or spreading viruses,” said Craig Shue of ORNL’s Computational Sciences and Engineering Division. While some have been caught by the Federal Trade Commission or other Internet service providers unwilling to do business with them, many are able to escape detection. “These other Internet service providers have customers whose machines become infected and can be used to launch attacks or steal the customer’s data,” Shue said. This work, which creates a ranking system Shue likened to grading systems for comparing school districts, is funded in part by the National Science Foundation and Indiana University. The latest story ideas coming out of Oak Ridge National Laboratory. Story ideas from the Department of Energy’s Oak Ridge National Laboratory. Sensors—Math to the rescue . . .
Making sense of the enormous amounts of information delivered by all types of sensors is an incredible challenge, but it’s being met head on with knowledge discovery techniques developed at Oak Ridge National Laboratory. Some of the strategies and approaches are outlined in a recently published book, “Knowledge Discovery from Sensor Data,” (http://books.google.com/books?id=dq7uAA3ssPcC) edited by a team led by Auroop Ganguly of ORNL’s Computational Sciences and Engineering Division. The book is specifically aimed at analyzing dynamic data streams from sensors that are geographically distributed. “We are especially interested in looking for changes – even ones that are very gradual — and anomalies,” Ganguly said. This work helps to validate and assign uncertainties to models developed to understand issues related to climate, transportation and biomass. Co-authors include Olufemi Omitaomu and Ranga Raju Vatsavai of ORNL. This research was originally funded by the Laboratory Directed Research and Development program. Cyber Security—Meeting of minds . . . Dozens of the nation’s authorities on cyber security will be participating in the Fifth Cyber Security and Information Intelligence Research Workshop April 13-15 (http://www.ioc.ornl.gov/csiirw). The focus of this event, which is open to the public, is to discuss novel theoretical and empirical research to advance the field. “We aim to challenge, establish and debate a far-reaching agenda that broadly and comprehensively outlines a strategy for cyber security and information intelligence that is founded on sound principles and technologies,” said Frederick Sheldon, general chair and a member of Oak Ridge National Laboratory’s Computational Sciences and Engineering Division, a sponsor of the workshop. Other sponsors are the University of Tennessee and the Federal Business Council. The workshop, hosted by ORNL, is being held in cooperation with the Association for Computing Machinery. Material—Graphene cleanup . . .
Graphene, a single-layer sheet of graphite, has potential as a remarkable material, particularly for electronics and composite applications. However, working with the material leaves molecular-scale rough edges, which can spoil its properties. 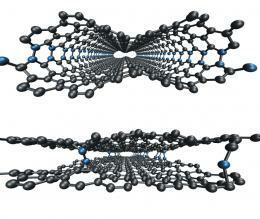 Researchers at MIT and the Laboratory for Nanoscience and Nanotechnology Research (LINAN) and Advanced Materials Department in San Luis Potosi, Mexico have been working with graphitic nanoribbons. Separate research performed at the Department of Energy’s Oak Ridge National Laboratory developed theory-based computer simulations with quantum mechanical calculations that explain how a process called Joule heating cleans up graphene as the rough carbon edges vaporize and then reconstruct at higher, voltage-induced temperatures. The collaborative project was recently described in Science magazine. Energy—Tighten up . . .
An effort to gather environmental data related to the energy efficiency of buildings through weatherization technologies will be conducted in a joint project that includes Oak Ridge National Laboratory’s Building Technologies, Research and Integration Center. ORNL engineer Andre Desjarlais says his group’s research will focus on the study of a building’s air tightness by monitoring unintended air movement – air leakage – between outdoors and indoors. In heating climates, up to 30 percent of the energy used in a building can be attributed to air leakage. The tests will be conducted at Syracuse University, which is also a partner. Other partners are the Air Barrier Association of America and it members, along with the New York State Energy Office. The DOE funding source is the Office of Building Technologies. Story ideas from the Department of Energy’s Oak Ridge National Laboratory. To arrange for an interview with a researcher, please contact the Communications and External Relations staff member identified at the end of each tip. MICROSCOPY—-STEM in liquid . . . . . . Researchers at ORNL and Vanderbilt University have unveiled a new technique for imaging whole cells in liquid using a scanning transmission electron microscope. Electron microscopy is the most important tool for imaging objects at the nano-scale–the size of molecules and objects in cells. But electron microscopy requires a high vacuum, which has prevented imaging of samples in liquid, such as biological cells.” The new technique – liquid STEM – uses a micro-fluidic device with electron transparent windows to enable the imaging of cells in liquid. A team led by Niels de Jonge imaged individual molecules in a cell, with significantly improved resolution and speed compared with existing imaging methods. “Liquid STEM has the potential to become a versatile tool for imaging cellular processes on the nanometer scale,” said de Jonge. “It will potentially be of great relevance for the development of molecular probes and for the understanding of the interaction of viruses with cells.” The work was recently described in the on-line Proceedings of the National Academy of Sciences. BIOLOGY—-Time-saving tool . . . . . .
Scientists studying human health, agriculture and the environment have a powerful new tool to help them better understand microbial processes and how they relate to ecosystems. The GeoChip consolidates into one analysis something that using traditional methods would require dozens of tests and take possibly years to complete, according to co-developer Chris Schadt of ORNL’s Biosciences Division. This lab on a chip features more than 24,000 gene probes that target more than 150 functional gene groups involved in biochemical, ecological and environmental processes. The GeoChip is especially useful for bioremediation of sediments and soils, determining the role of microbes in soil and learning how microbial processes are connected to ecosystem responses to human-induced environmental changes such as temperature, moisture and carbon dioxide. This research was funded by the Department of Energy’s Office of Biological and Environmental Research. CYBERSPACE—-Thwarting threats . . . . . .
Colonies of cyber robots with unique missions can in near real time detect network intruders on computers that support U.S. infrastructure. These “cybots” created for an ORNL software program called UNTAME (Ubiquitous Network Transient Autonomous Mission Entities) may be especially useful for helping government agencies deter, defend, protect against and defeat cyber-attacks. “What scares us the most isn’t what we can see, but rather what we can’t see,” said Joe Trien of the lab’s Computational Sciences & Engineering Division. “A coordinated cyber attack could disrupt one or more of U.S. critical infrastructures, and these attacks can reach across the world at the speed of light.” Trien led a team of researchers that developed UNTAME. COMPUTING—-First petascale projects . . . . . . The National Center for Computational Sciences at Oak Ridge National Laboratory has granted early access to a number of projects to test Jaguar, which has peak performance of 1.6 petaflops and is the most powerful computer in the world for open science. The “Petascale Early Science” period will run approximately 6 months and consist initially of 20 projects, said NCCS Director of Science Doug Kothe. The early phase period seeks to deliver high-impact science results and advancements; harden the system for production; and embrace a broad user community to use the system, Kothe said. Proposals include: modeling to better understand climate change; energy storage and battery technology; cellulose conversion to ethanol; combustion research for more efficient automobile engines; and high-temperature superconductors for more efficient transmission of electricity. Fusion, nuclear energy, materials science, nuclear physics, astrophysics, and carbon sequestration also will be explored. “These early simulations on Jaguar will also help us harden the system for a broader collection of projects later in the year,” said Kothe. Here’s the monthly group of story pitches from Oak Ridge. Climate—Spotlight on CO2 . . .
Data from NASA’s Orbiting Carbon Observatory combined with computational power and tools provided by ORNL researchers will result in unprecedented levels of information about atmospheric carbon dioxide. The satellite, scheduled for launch in mid-January, will collect precise global measurements of CO2 and transmit that information to Earth. Using version 5 of the Goddard Earth Observing System model (GEOS-5), developed by a team that includes ORNL’s David Erickson, scientists will with great precision be able to see sources and sinks of atmospheric CO2. The combination of Jaguar’s massive computing power – 1.64 petaflops per second (peak) – and scientific interpretations aided by NASA satellite data should for the first time give scientists a clear picture of where carbon is being produced and where it ultimately ends up. Funding is provided by NASA and the Department of Energy’s Office of Biological and Environmental Research. Energy Efficiency—Heat to power . . . Combined heat and power (CHP) technologies, which capture and reuse waste heat from electric or mechanical power, account for about 9 percent of annual U.S. power generation. Roughly doubling that capacity could cut projected U.S. carbon dioxide emissions by 60 percent by 2030– the equivalent to taking 45 million cars off the road — an Oak Ridge National Laboratory study shows. Current CHP systems made up of gas turbines, fuel cells or engines combined with heat exchangers and chillers cut 1.8 billion Btu of fuel consumption and 266 million tons of CO2 emissions compared to traditional separate production of electricity and thermal energy. In addition to the 60 percent CO2 reduction, raising CHP generating capacity to 20 percent would create a million new jobs; $234 billion in new U.S. investments; and fuel savings equivalent to nearly half the total energy now consumed by U.S. households. The ORNL report on “Combined Heat and Power: Effective Energy Solutions for a Sustainable Future” is sponsored by DOE’s Office of Energy Efficiency and Renewable Energy Industrial Technologies Program. Isotopes—Banner year . . .
Californium-252 and actinium-225 generated half of the $5 million in sales for the Department of Energy’s National Isotope Data Center at ORNL in fiscal year 2008. That amount represents a $1 million increase from 2007. Californium-252 — used as a start-up source in nuclear reactors, in analyzers for the coal and concrete industries and in detectors for homeland security — produced $2 million in sales. Actinium-225, an isotope extracted as a product of the decay of thorium-229 and used in radiotherapy trials for various cancers, including ovarian, lung and myeloid leukemia, accounted for more than $500,000. The Californium-252 is produced at ORNL’s High Flux Isotope Reactor in conjunction with the lab’s Radiochemical Engineering Development Center. ORNL offers a wide range of capabilities in isotope production and irradiation tests for materials research. Beyond these contributions, HFIR, supported by the Office of Science, is a world leader in producing neutrons for materials studies. Sensors—On the prowl . . . Mathematics and sensors come together in some new ways to form a powerful tool for combating terrorism, piracy and the transport of drugs. In a project that combines resources at ORNL and Clemson University, researchers and students are using something called Level 3 sensor fusion to identify and predict the behavior of ships, tanks, people and more. “This means we not only know where they are, but we can make educated guesses about what they’re going to do and when,” said Chris Griffin of ORNL’s Computational Sciences & Engineering Division. The system, called LEPERD – Learning and Prediction for Enhanced Readiness and Decision Making – involves a lot of new math and uses techniques from pattern recognition, learning theory, statistical analysis and control theory. Funding is provided by the Office of Naval Research. ENERGY — Powering the Big Apple . . .
High temperature superconductor (HTS) technology developed at Oak Ridge National Laboratory is being used in a $39 million project to boost and secure Manhattan’s power grid. Project HYDRA, partially funded by the U.S. Department of Homeland Security Science and Technology Directorate, seeks to install and field test HTS cable in New York City’s electrical power grid by 2010. ORNL helps design and test the cable which will boost power delivery 30 percent; increase reliability and security; and limit fault currents caused by tree branches, lightning, and other interruptions that hamper the nation’s electric grid. Industrial partners include American Superconductor Corp., which has shipped more than 56,000 feet of wire for the project; Consolidated Edison Co., which operates Manhattan’s power delivery network; and cable manufacturer Ultera, a joint venture between Southwire Co. and nkt cables. ENERGY — A DST bonus . . . CLIMATE — Mapping change . . .
Maps showing possible regional impacts of climate change in the Dominican Republic could play a role in setting policy there and beyond. The maps, generated by a group of researchers at Oak Ridge National Laboratory, will be used for climate change policy discussions and published in a future issue of Foreign Policy, a publication widely read by international policy makers. Projected increased temperatures are just one of the extreme regional stresses considered in the comprehensive ORNL study captured in a series of maps that focus on resource scarcity, extreme events and other impacts of climate and population change. The overall study was led by Auroop Ganguly while the maps for the Dominican Republic were primarily generated by Esther Parish with help from Karsten Steinhaeuser, all of the Geographical Information Science and Technology Group. The research was funded by a grant to ORNL from the Institute for a Secure and Sustainable Environment at the University of Tennessee. Foreign Policy magazine is a non-partisan publication recently acquired by the Washington Post Co. from the Carnegie Endowment for International Peace. SENSORS — Right on target . . .
Keeping track of weapons at nuclear facilities and other installations could get a lot easier with a technology developed by researchers at Oak Ridge National Laboratory and Visible Assets of New Hampshire. The technology, which uses low-frequency magnetic waves to transmit signals from tags installed in a pistol’s grips, solves a huge problem caused by human error during the inventory process. Future system enhancements will make it possible to count the number of shots fired, eliminating any guesswork about when a weapon needs to be serviced or replaced. A team led by Chris Pickett of ORNL’s Global Nuclear Security Technology Division developed the system software and completed the system integration. The team also conducted operational tests and is working with DOE armorers to complete rigorous tests to evaluate the sensor’s performance, durability and security. Those tests will soon be complete, which will clear the path for Department of Energy facilities to purchase the equipment from Sig Sauer, which licensed the technology. Funding was provided by DOE’s Office of Health, Safety and Security. Did a little steel blogging recently here involving nanotech, this release covers another high-performance steel, sans nanotech. OAK RIDGE, Tenn., Oct. 24, 2008 – Researchers at Oak Ridge National Laboratory and the U.S. ITER Project Office, which is housed at ORNL, have developed a new cast stainless steel that is 70 percent stronger than comparable steels and is being evaluated for use in the huge shield modules required by the ITER fusion device. ITER is a multibillion-dollar international research and development project to demonstrate the scientific and technological feasibility of fusion power and to enable studies of self-heating burning plasmas. It will require hundreds of tons of complex stainless steel components that must withstand the temperatures associated with being in the proximity of a plasma heated to more than 100 million degrees Celsius. The ITER device will be assembled in Cadarache, France, using components fabricated in the United States and in the other partner nations – China, the European Union, India, Japan, the Republic of Korea and the Russian Federation. It is based on the tokamak concept, in which a hot gas is confined in a torus-shaped vessel using a magnetic field. When operational, the device will produce some 500 MW of fusion power. Jeremy Busby of the ORNL Materials Science and Technology Division said the ITER shield modules present a particular challenge. “The United States must produce nearly 100 of these modules that are 3-4 tons each and include geometric shapes and openings,” he explained, adding that drilling holes in solid steel would result in the removal and loss of 30 percent of the material. The team has utilized a science-based approach involving modeling, advanced analytical techniques and industrial experience, building upon past R&D 100 award-winning efforts with other cast steels. The availability of advanced materials property simulations at ORNL also played a significant role. “We have used all the science tools available to us at the laboratory,” Busby added. The effort began with the preparation of test steel compositions in small batches that will be scaled up to more representative geometries. Focus areas include improvements in fracture properties, tensile strength, microstructure properties, welds, impact properties, corrosion performance and radiation resistance. Busby is hopeful about when the new material might be needed for ITER. The overall design of the device is being tweaked as part of an international review held earlier this year. “We expect to hear fairly soon about how our cast stainless steel may be used in this groundbreaking project,” he said. ORNL is managed by UT-Battelle for the Department of Energy. U.S. ITER is a DOE Office of Science project. It may not be pretty, but it is pretty cool. In a step toward developing better fuel cells for electric cars and more, engineers at MIT and two other institutions have taken the first images of individual atoms on and near the surface of nanoparticles key to the eco-friendly energy storage devices. 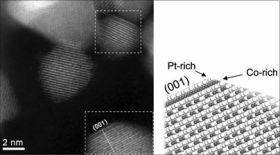 Nanoparticles made of platinum and cobalt are known to catalyze some of the chemical reactions behind fuel cells, making those reactions run up to four times faster than if platinum alone is used as the catalyst. Look for media on these stories in the coming weeks and months. For more information on ORNL and its research and development activities, please refer to one of our Media Contacts. If you have a general media-related question or comment, you can send it to news@ornl.gov. Transportation—New data available . . .
Energy—Microturbine magic . . .
Geology—Compelling evidence . . .
Physics—Quadrupole DNA sequencing . . . Researchers at Sandia and Oak Ridge National Laboratories have launched the Institute for Advanced Architectures to do basic research on issues such as power consumption and reliability for an exaflop (10^18 floating point operations per second) system that could have a million hundred-core processors. The U.S. Department of Energy and the National Security Agency expect to need exaflop computing by 2018 for large-scale prediction, materials science analysis, fusion research, and national security problems.